Following on from my ‘personal learning notes’ from my Farne Island blog on wildlife photography technique I have some great conversation with Alan Hewitt from Hawkshead Photography. I thought I would update what I have learned. Prior to my Farne workshop Alan had persuaded me to use my D800 instead of my D7000 which is my normal default for wildlife – of course I did rent a 200-400 f/4.0 which helped that decision. So this blog is the context of EXPEED 3 processing and the 51 point auto-focus. I was really impressed in the improvement with the D800 compared with my D7000 and have been tempted to switch to the D7100 as a consequence as it has the same auto focus and processing. However it seems the buffer on the D7100 is so pathetic if you use RAW you are lucky to get 3-4 sequential frames. I still don’t know what to do as at the moment a 200-400 f/4.0 is out of budget to buy and even renting for a few weeks is expensive and JPEG seems such a retrograde step – off to Africa again for 3 weeks in Nov/Dec this year. I dare say I will blog about this over the next months. Use single-point AF for “autofocus area mode”. A new thing I have learned is that on the D800 if you click the centre button on the multi selector it reverts to the centre focus point (saving scrolling and time). 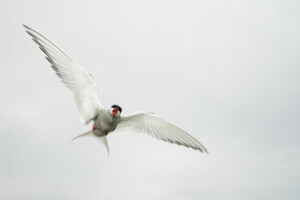 Also the image size of the D800 enables cropping to give space to the front of the bird and reduce it behind. Not all of the 51 focus points are equal there are two types – cross hatch and line points. The cross hatch points are central and are much more sensitive as these are 2D rather than a horizontal line (in landscape frame). In addition not all focus points remain ‘designated’ as cross hatch, they ‘degrade’ to line points, depending on the Nikon AF lens (or combinations with a teleconvertor) you are using – this occurs were the widest aperture is between f/5.6 and f/8.0 (note: AF lens open the aperture as wide as possible whilst focussing regardless of any setting you have dialled in). 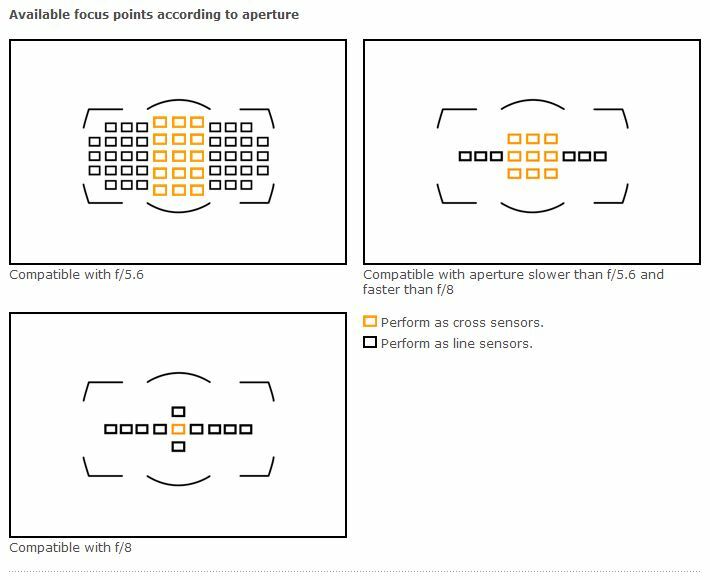 The distribution of the points on the D800 can be seen below – see Nikon for more information. 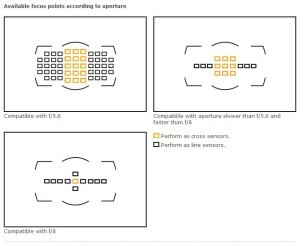 So understanding which focus points are cross hatch for the lens (or lens/ teleconvertor combination) is important so that by default you can use them rather than the line focus points. In other words use centre points and compose the image frame in post-processing. On the D7000 and D800 use “Release” this is because it takes significant processing to get focus ‘lock’ and it means you cannot grab a reasonable frame rate – of course some shots will end up out of focus as time speeds by and the animal, or you, moves. I am comfortable with this for the D7000 but I am uncertain that “Release + Focus” is not a worthwhile compromise – going to try though! To minimise the problem of having shots out of focus using “Release” it is important to separate the focusing action from the trigger action. This done by using “AF-ON” alone and disable focus on the trigger (“a4 – AF activation” set to OFF). This means the trigger button will not attempt to re-focus when you take a continuous shot sequence. You are reliant on your depth of field and AF-C tracking (given you keep your thumb on the AF-ON button) to ensure a series of shots are in focus. I am sure this needs loads of practice to get “rid” of years of learnt behaviour. Using “AF-ON” as OFF is also meant to switch off VR which saves battery and I have found to be limited help if not handholding – the D800 and D4 firmware don’t do this at the moment (they should) so if you can remember turn it off – do so. The D800 normal flash sync speed is 1/250s and I found this to be too slow when taking flash enhanced bird shots on the Farne’s. However using “Custom Setting Menu > e1 Flash Sync Speed” it is possible to change this all the way to 1/8000s. Choose “1/320s (Auto FP)” or “1/250s (Auto FP)” then use shutter-priority or manual modes to set the shutter speed to anything you want. When you set the shutter speed to faster than 1/250s the camera fires the flash in thousands of short pulses instead of one big flash. Obviously the faster the shutter speed the less power the flash can manage and you are dependent on the ambient light.